BY TAMAR NEUMANN: Every once in a while I see a Shakespeare play that completely redefines the way I think about a particular play. It doesn’t happen often. I happen to see quite a bit of Shakespeare and I’ve been blessed with the opportunity to see some of the world’s best acting companies perform it. I’ve spent years studying and teaching Shakespeare and when I attend a play I generally know what to expect. The last time I was surprised by a production was in 2004 in London by a Hamlet production directed by Trevor Nunn. His production was so surprising and challenging that I have refused to see Hamlet since. That feeling of surprise and wonder was just recently repeated at the production of Henry IV Part I currently being performed by Ten Thousand Things Theatre Company. If you are unfamiliar with the play it’s the story of Prince Hal (Henry) and his merry band of thieves. While he is trying to decide if he will take his place as the rightful prince, his father is fighting off conspirators who want to take the throne. The play is perhaps best known for the character of Falstaff—a lovable, fat drunk who lies merrily and is mercilessly made fun of throughout the play. 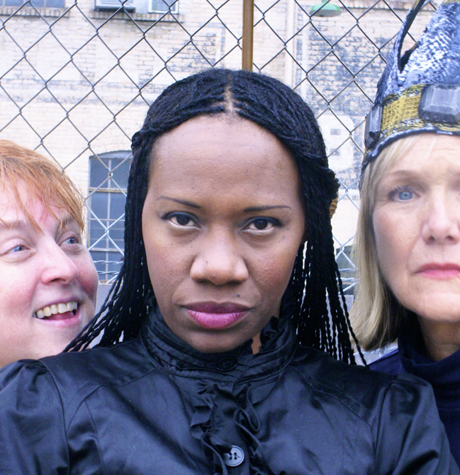 Ten Thousand Things, in their effort to experiment with Shakespeare, chose to cast the play with all women. It’s a small cast of eight actors, of which seven play various roles. It was quite interesting to watch this play with all women. It truly did change the nature of each character. When Hal’s thieves come together to steal money from some travelers it didn’t feel as ferocious as it might have felt with men. It almost felt like a slumber party—but that is not meant as a criticism. Instead that feeling helped to draw out the comedy in that scene in a way I hadn’t thought of before. At the end, as Henry and his father reconcile and recognize that they are truly father and son the reunion didn’t have the same poignant feel as it does when a father finally accepts and recognizes his son. The father son bond lost its power when played by two women. But once again, while that piece may not have been as powerful, it didn’t detract from the quality of the play; instead it shifted the focus of the play to Henry and the choices he was making. And while it may sound like the women add a softer touch to the play, don’t be fooled—these women are fearless and their battle scenes do not lack in strength or ferocity. But what was truly commendable was not the choice to cast this play with all women. My view of this play was changed because of the actors’ performances. At some point in time, the language of Shakespeare became an affected language. When you see Shakespeare it is always spoken with some odd accent and a specific lilt to the lines and words. If you think about it, it makes sense because the language is old, the style is poetic, and Shakespeare was British so we try to imitate that in our own way. In contrast to this traditional view of Shakespeare the actors in this production spoke just like you or I would speak on a regular basis. It’s difficult to describe, but when you watch these women you slip easily into their world because they make your comprehension of the language effortless. This is partly because some lines are added in with modern language. It’s also partly because the actors get the audience involved in the show so you feel like you are living in the world of Henry IV. But it’s mostly because these women and their director did an astounding job of making Shakespeare understandable, approachable, and relatable. While all the actors should be commended for their performance, this review would be remiss if I didn’t mention just a couple by name. Shá Cage, in her role as Prince Hal, must be applauded for her portrayal of a frat boy turned noble prince. She is both funny and tragic as Hal transforms in the play from a prankster to a member of the royal family. Karen Wiese-Thompson must be praised for playing Falstaff (one of the most beloved Shakespeare characters) with honesty and integrity. She provided the comic relief but she gave Falstaff heart and sympathy. It’s hard to play a character so widely known and loved but Wiese-Thompson does it with grace and aplomb. Lastly, Anna Sundberg as Hotspur truly encompasses the volatile emotions that so easily come and go with Hotspur—thus giving him his name. Her delivery of her lines was so natural that I found myself wondering if she had somehow changed Shakespeare’s words and made them more modern. Her version of Hotspur deserves to be recognized as a truly magnificent performance. As I close up this review it may feel like I have over-praised this play a little. And perhaps I have. But I found myself enjoying the show so much I can’t help but encourage others to see it. When I find myself seeking out people just to encourage them to see a particular play, I know it was a unique and wonderful experience. It has taken me a few years since living in Minneapolis to make it to a Ten Thousand Things show, and now that I have, I am truly sad that it took me so long.